Jennifer Last year we went to Sollentuna and then to Ekoln so that Joe could try his hand (feet?) 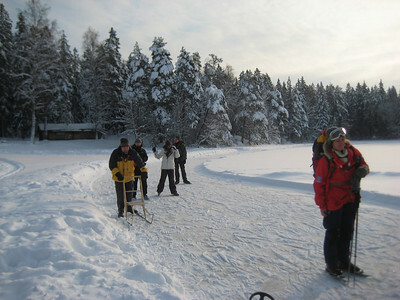 at långfärdsskridskor, the long-distance skates favored by those who wish to travel or exercise on natural ice. But there is another option, the kicksled, or in Swedish, "spark" (which just means kick, but specifically means a violent sort of kick). Kicksleds are just that: lightweight, flexible, two-runner sleds with a seat on the front, traditionally used for getting you and all your gear out to the middle of a lake for ice fishing, and then providing you a seat while you fish. 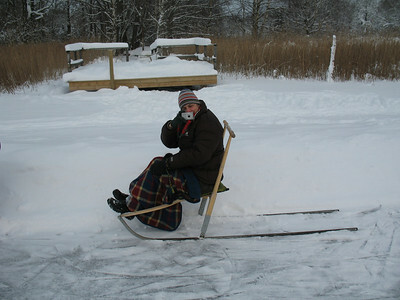 Joe wanted to try one out, as a more stable way to get some speed on the ice, and it also occurred to us that perhaps someone could sit on the sled while being pushed around by someone else. So last week, when our Swiss friends G. and D. said that they had found a place where one could rent kicksleds, we were happy to give it a try. 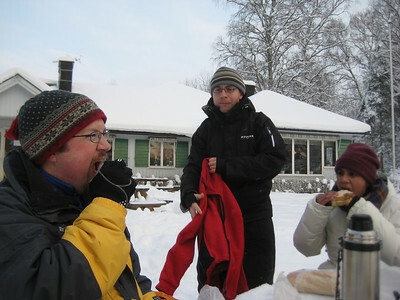 We drove through the snow-covered countryside for about 20 minutes east of town to Fjällnora friluftsområde, a recreation park situated on a lake called Trehörningen. 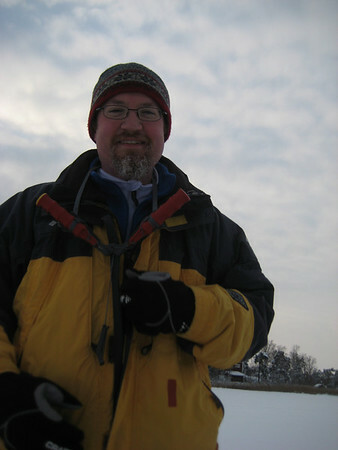 In the winter, the lake freezes completely and several paths are regularly cleared of snow for skating, which means that the ice, while not Zamboni-smooth, is not too bumpy either. These places in Sweden seem to be quite civilized, with not only rentals but a cafe and restaurant available. You can even rent a portable 6-person wood-fired sauna to take out onto the ice, where they will also carve you a hole for polar-bearing. Later in February, there will be an organized night-skating, with the paths lit by torches. The kicksled turned out to be a little more ricketty looking than I had anticipated, but after a 1 km practice loop that seemed to go pretty well, we set off on a 5 km loop around about half of the lake. There were a comfortable number of other people there—enough to feel social (everyone seems relaxed and happy when out for a skate) and safe (it is after all wild ice, and despite constant monitoring, people do go through it sometimes), but not so many people as to be crowded at all. Joe claims that the sled is easier to handle with a bit of weight on the seat, and I think maybe he's not just being gallant. The pace of the kicksled is brisk enough to really feel that one has some speed, and I was glad for a blanket over my lap and a scarf to pull up over my face. It was a beautiful day, not completely clear, but with enough sunshine to light up the frozen reeds and snowy pine trees lining the lake. I had privately predicted a spill, if we hit a rough patch of ice, but it never happened. When we completed our round, we headed up to a picnic area to eat a little lunch of sandwiches, hot tea and cocoa, and peanut butter-oatmeal-chocolate chip cookies that Joe made last night. Lots of other people were having their lunch outdoors as well, but perhaps it would have been wiser to go into the building to eat... rather suddenly, we all realized (or admitted) that it was really quite cold, and maybe it was time to call it a day (-10C said the car thermometer when we went back, but I would have called it colder than that). So back to the car (with a brief pause to admire the fuzzy pony and furry goats at the petting zoo), and back to town for a couple cups of hot coffee at our place. It was a very pleasant way to spend a couple hours on a Sunday afternoon, and we hope to do it again while it's still the season. It was lots of fun to ride on a kicksled, but what's it like to push one around? Not too bad, I guess, but more exact details will have to wait for next time: my driver, having had a hot shower, is now peacefully ensconced on the couch under a blanket, snoring gently.